A Quick Meal for Busy Kids! So, I’ve been debating whether to write a post on this as it’s pretty simple, but Lo encouraged me to. I don’t know what your schedule is like, but our family is scattered about 4 nights of the week. The challenge is to get good, healthy food into the kids so they have enough energy for all of their activities. 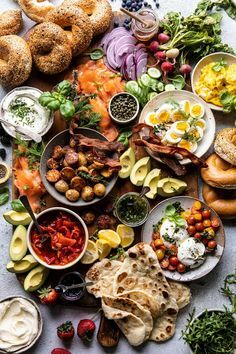 In particular, I have a daughter who doesn’t need much protein, so I’ve been trying all sorts of things to get her intake up! Lately, it’s been breakfast sandwiches. The kids really love them, they are super fast to make (seriously they take about 5 minutes!) and they are full of protein and good carbs! They great thing is you can make them up, wrap them in foil and they will stay warm for quite awhile. My kids often eat them after school at home or I bring them at school pick up and they eat them enroute to dance and hockey! 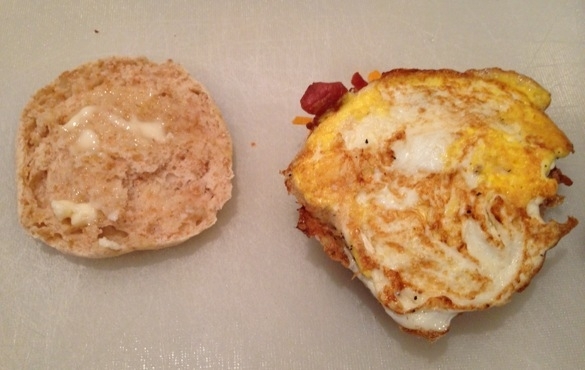 If you have these ingredients on hand, you can whip up these breakfast sandwiches in minutes! I start by having 3 squares of foil ready (one for each sandwich). This also helps to eliminate any mess! I pop the English muffins or bagels in the toaster and then get started on the eggs. Use a nonstick pan and spray is with cooking spray. Heat up to medium high heat. 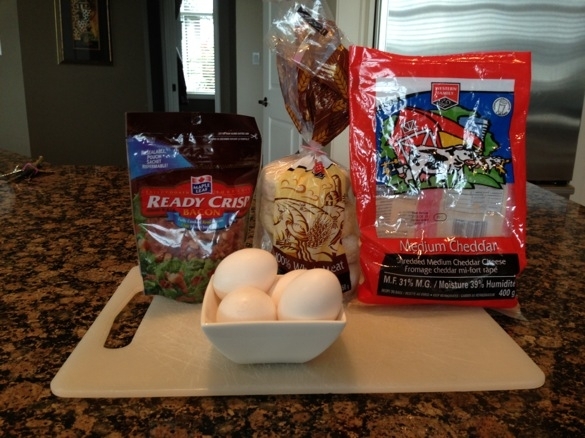 Crack each egg individually and try to keep them separated. 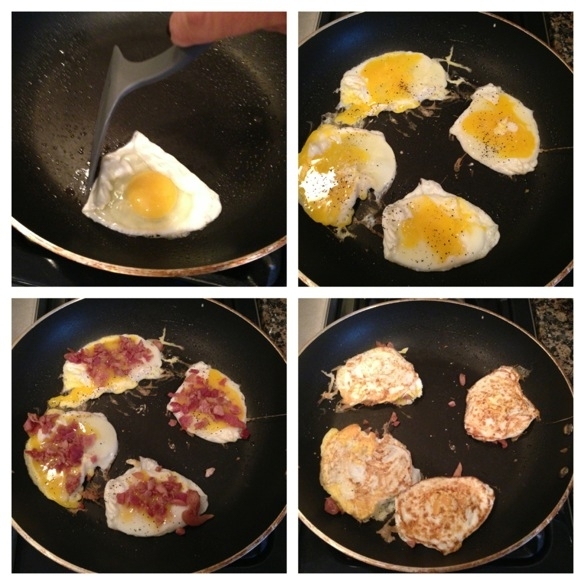 I use a spatula and push the edges toward the center of the egg as it’s cooking. My kids like the yolk cooked, so i break it up with the spatula. Add some salt and pepper. Once almost ready to turn, sprinkle with real bacon bits. Turn the eggs and add salt and pepper again. When the English muffins or bagels are toasted, put one set on each piece of foil and butter both halves. Sprinkle one half with the grated cheese. Put the cooked egg on the half with the cheese. Put the other half the English muffin or bagel on top and wrap up in the foil. The heat from the eggs will melt the grated cheese. Maguire (my son) loves to add Buffalo Tabasco sauce on his…I think he thinks he’s from the south! He definitely inherited his love for spice from Jason! I usually pack along some strawberries or grapes and bring Bolthouse Farms or Happy Planet juice as well to get their fruits in! Here’s a tip…you can buy the fresh juices in larger containers. Go to your local restaurant supply store (such as HY Louie) or Costco and buy disposable cups with lids. I put the cups into a Tupperware container so that they fit snuggly…. no split drinks on the way to pick up! 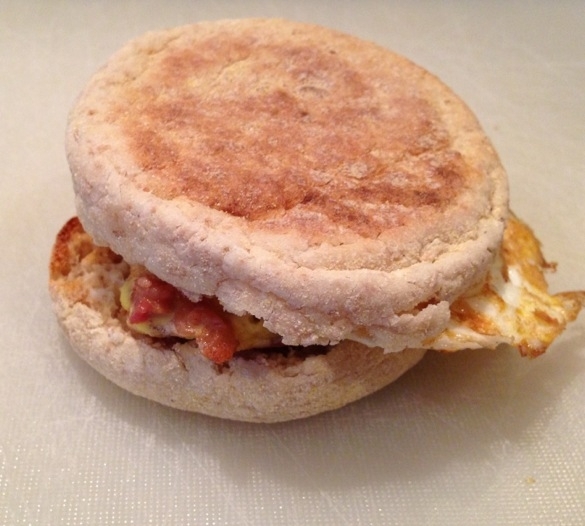 When I made the kids breakfast sandwiches this week, Maguire said, “Mom, your breakfast sandwiches are better than any restaurants?” Well….see if you or your kids agree! « Sugarplum Sisters: Ladies Night Out Countdown!